Recently I've acquired a huge interest in Tokusatsu and made an homage to the genre, the hero named Insektor! He has the standard "super-package": improved strength, stamina, reflexes, and durability. He also has an enhanced metabolism, making him recover from injuries somewhat faster than usual. @bulgarex I read your recent posts about Supertech on Champions Earth, and I was thinking about some sort of alien artifact as responsible for Insektor abilities. 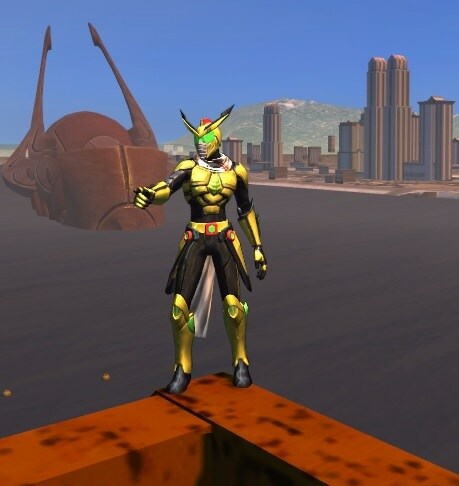 There's any alien tech, or even a tokusatsu-based hero in Champions PnP that could be used as reference? Also, what organizations (alien or not) have the resources to genetically improve somebody to superhuman levels? The protagonist in Kamen Rider Black was some sort of enhanced mutant, I could also follow this storyline. Just off the top of my head? Hzeel Technology and human biology have been known to have some funky interactions. Implicit compliment humbly accepted, thank you. theravenforce is justified in citing contact with Hzeel semi-biological technology as a potential origin for your character. You can read more about the Hzeel on The Alien Thread. However, nothing about the Hzeel or their tech implies an insectile motif, so that might not be the top option. There actually is an official tokusatsu-inspired hero team in the CU, based in Ottawa, Canada. COMET (City of Ottawa Metahuman Emergency Team) were originally five college students on a field trip to northern Canada, who stumbled across and "awakened" a buried alien artifact, which attempted to convert them into plant-based living solar batteries so it could refuel itself; but it "died" from the effort. The students were left with biotech "suits" integrated with their bodies which they can manifest at will, giving them various light-manipulating abilities. In the 1980s an astronaut gained similar powers after an encounter with aliens, becoming the hero called Solar Sentinel. The identity of the aliens responsible for these events is unknown; but again, their tech motif is plant-like, not really what you're looking for. However, the precedent is clearly there, and the setting holds several other possibilities. High on that list would be the Qularr. Their species' look isn't far from your character's, and their technology is well established as partly biological. The Qularr are very much into bio-engineering; in fact their original motivation in invading Earth was to learn how to engineer humanity's superior potential for manifesting super-powers into themselves, by obtaining a whole planet full of possible test subjects. The Qularr on Earth today are almost certainly acquiring humans to experiment on, which could easily result in a character like yours who escapes their control. The advantage to this origin is that you already have a well-established official hostile organization which would be bent on recapturing you. If you'd like a more benevolent alternative, the Se'ecra are one of the more advanced races in the galaxy -- not at the top tier like the Malvans or Mandaarians, but well up there -- who resemble bipedal four-limbed beetles. You can read more about them as well on the above-linked Alien Thread. The Se'ecra are well known in the galactic community as well-intentioned meddlers in the affairs of other species, out of the most altruistic of motivations. Officially they haven't made contact with humanity yet, but an explorer or lost traveler would very likely try to help a deserving human in what it thought would be the best way possible... whether or not said human actually asked for or wanted help. Those are the options that appear to me likeliest to give you what you want. If none of them work for you, please state your concerns and preferences and we can try other alternatives. Feel free to post any followup questions. Guess I'll stick with the Se'ecra! Thanks! (Haven't decided Insektor's civil name yet, so I'll call him Joe for now) is returning home after his kung-fu training when he sees what appears to be a shooting star really close to his location. He immediatly goes to the crashing site, not knowing exactly what compeled him to do so. Arriving there, he sees a badly injured Se'ecra explorer leaving the ship. "Joe" notices the alien is wearing a belt with a flashing light in the center. Using his translator device, the beetle humanoid says there's a great alien invasion coming (I have no idea what alien race to pick. The Se'ecra have enemies? The Qular? The Gadroon?) and Earth is in great danger. The alien original idea was to warn the Champions at their headquarters, but he got chased by the (chosen race alien) and crashed. With his life fading and sensing a strong sense of goodness on "Joe", the Se'ecra decides to gift him with the strange belt. The belt was actually a device capable of merging with it's user DNA, thus triggering an amazing transformation! It was supposed to be delivered to the Champions, in order to aid them in the upcoming fight against the (chosen alien race). But now, wether "Joe" likes it or not, he got bound to a marvelous fate! Right after receiving the belt, the Se'ecra dies and the alien chasers arrives. "Joe" transforms into Insektor and defeat the (chosen alien race). He then learns that the transformation lasts for 1h, and the belt needs a 24h recharge after that. Do you think that's acceptable, @bulgarex ? I need some help choosing the enemy alien race. That sounds pretty consistent with Se'ecra. They've offered help both covert and sometimes overt, to protect a less-advanced race against alien invaders, or even to overthrow oppressive domestic regimes. They've also been known to "uplift" other species with gifts of scientific knowledge, and/or sophisticated social or philosophical doctrines. The Se'ecra don't have identified specific enemies, but don't need to be personally involved with an aggressive species to intervene in their activities on behalf of someone else. Of the known hostiles races who are likely to be a menace to Earth, I don't think the Se'ecra would feel the need to warn humanity about Gadroon or Qularr. Champs Earth is very well aware of them. Still, the Se'ecra would almost certainly want to help Earth counter them. I can think of a few other looming threats humanity doesn't yet know about or doesn't fully appreciate, that Se'ecra might have learned of. As is often the case, each choice has its own benefits and drawbacks. The most imminent hidden threat is from the Hzeel. They've been secretly scouting Earth for decades, and would probably have already invaded if the Qularr and Gadroon's renewed interest in our planet had not prompted them to hold off and observe their progress. It would make particular sense if the Hzeel were the threat for a Se'ecra to seek out the Champions, since their war with the Perseids, Ironclad's people, are the reason the Hzeel want Earth for an advance staging area (although Ironclad doesn't know any of that). Hzeel would also be easy to make with the CO character creator. They don't have any known "super" specimens, though, and don't seem to manifest super-powers. The biggest looming danger is from Istvatha V'Han. The Empress of a Billion Dimensions has already tried to invade Earth, so humanity is aware of the magnitude of her threat. What they don't know is that V'han has manipulated both the Gadroon and Qularr into attacking Earth, to test and soften up its defenses prior to her own next invasion. The Champions had considerable success forestalling one of Istvatha's past invasion plans, so again, they'd likely be sought out by the Se'ecra. Anyone with a stake in stopping V'han's scheme could be pursued by the wide range of her assets: covert assassins, military strike teams, or superhumans of any stripe. But you should be comfortable with your PC getting mixed up in the deep plans of one of the heaviest weights in the setting. If you'd like the menace the Se'ecra came to warn about to be particularly monstrous, it doesn't get any worse than the Xenovores (whom you can also read about on the Alien Thread). Per the official timeline those horrors won't make formal contact with the human race for a few centuries, when we've already started to explore the stars. However, Golden Age Champions mentioned that the heroic Justice Squadron fought a band of Xenovores in Los Angeles during WW II, so we know they're already capable of finding their way here. A conflict with Xenovores would probably emphasize stopping them reporting their discovery of a relatively primitive planet overflowing with tasty sapients, to their superiors. But that would tend to limit their use to just however many landed on this planet, without the support of their people's empire. To maintain a sharply focused plot, a Xenovore explorer ship could have been crippled and crashed on Earth after being intercepted by a Se'ecra vessel, which was also damaged in the fight. Using Xenovores would open another route to an accidental origin for your character, linked to them. Xenovores are particularly adept at the biological sciences, including engineering castes suited to particular jobs, like the Qularr. They make very extensive use of semi-biological nanites, not just medically but in their manufacturing, ingesting raw materials and building from them everything from hand weapons to starships, like bees fashioning a hive. If a Xenovore explorer ship crashed on Earth, it might have jettisoned a canister of nanites which your PC could have found and become infected with. Who knows how they would affect him? Particularly if they were damaged or otherwise altered in the crash. Xenovores do have a quasi-insectile appearance, so it wouldn't be a huge stretch for the nanites to remake him as per your costume design. Those are the nearest and likeliest aliens to menace Champs Earth, but there are plenty of other nasties beyond Earth if those won't fit. It would just require more effort to justify bringing them here. Those are great options, I'm still deciding between the Hzeel and the Xenovores. That pretty much covers everything I need, thanks a lot for the help!